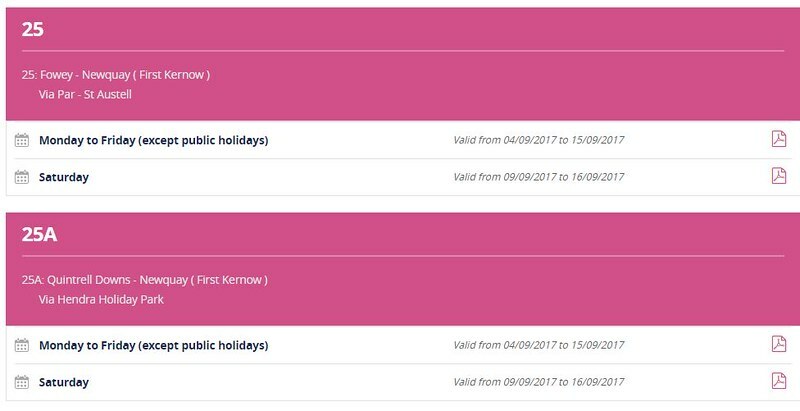 The big three - Go Ahead (Plymouth Citybus), Stagecoach (Stagecoach Devon) and First (First Kernow) have all had updates to their web sites making them more corporate along the way which has left us all with a worse local experience than we ever had before. The aim seems to be set everything up to look good on mobile phones but in the process loose all the good stuff that was available on proper PCs. New all singing mobile apps which offer so much but deliver so little seem to be the way things are now. National web sites which local companies seem to struggle to keep up to date. So lets see how First Kernow are doing? They were having all sorts of problems with their service changes this weekend earlier with nothing appearing until very late in the day. so 4 options - I would guess either Planned changes is the best one to start with - and yes - there is now a note about the changes due. Unlike Stagecoach the links to the timetables go to PDF pages that you can open and view rather than just download. Interestingly if you select the News and Service updates you also get the planned changes page along with a twitter feed which is a nice touch too - but then wouldn't it be easier just to have them all one page anyway so its clearer where to look? Not a big issue but it always helps to make things as easy as possible. The timetables which do have links working are nice and tidy and print out as nice colourful PDF pages to a fairly consistent design. so not as fussy as the Stagecoach search. The box did initial default to 251 when I tried to get the 25 as I that one is not yet in the Cornwall Transit as its taken First so long to sort things. However the results are clear and also give easy to read date ranges so you should be able to see which timetable to use. I am still not convinced you need a separate timetable for both Saturday and Sunday but I can kind of of see why some would like that. The timetables they link through to are different to the PDF linked files. These are quite plain but they are pretty clear. So - what about the routes themselves - are there any maps. 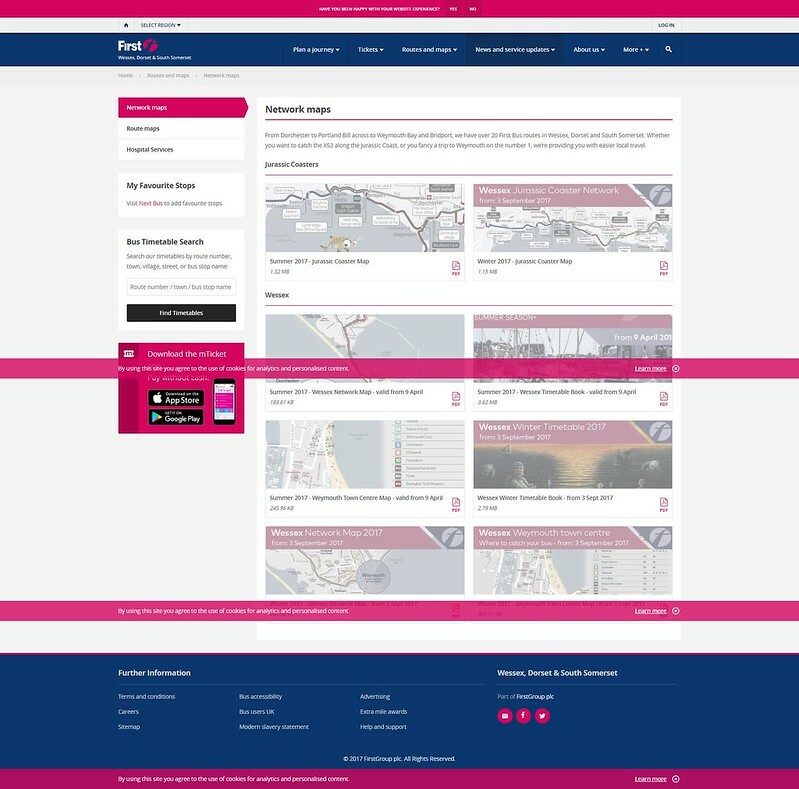 All in all its a much better web site and easier to use than the Stagecoach site. There are gaps in map provision and the company do seem to have had issues keeping this site up to date at times but at the moment its not too bad. The next lot of timetable changes come up in mid September - so lets wait and see how long that takes. although, at the moment these links don't work! Most impressive is the full local timetable book for September with all the times and maps. Excellent! First Wessex's booklet is really good. Sadly the other First bus areas don't seem to think it's worth copying. The frustrating thing is that First Kernow do actually produce a booklet, but refuse to put it online - I asked them a few weeks ago to email it to me and they wouldn't! Crazy. They put extracts from it on their service updates - they're much easier to read than the standard ones you find in the timetables section of the website (e.g. you don't have to use separate pages for Mon-Fri, Saturdays and Sundays), which I guess are designed by the IT department instead of people who deal with customers. I look forward to your forensic analysis of Travel Cornwall and St Ives buses, who make First look like angels! Keep up the good work. Agree that Wessex's booklet is very good; so are the Southampton and Solent versions. Presumably done by the same people. And First Kernow won't post it to you either, as their travel shops have reduced hours these days where do you get one from?